It’s finally here and I can barely hold back my tears! As a big Bones fan and a fellow musician/music producer, Carole & Tuesday is something that excited me the moment of its announcement. The quick introduction of the duo that is Carole & Tuesday is rushed but as long as the rest of the story is developed in a meaningful way, it should be fine. 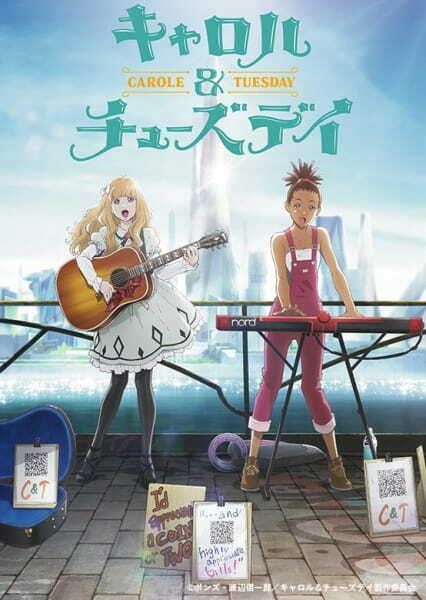 The scene where Carole and Tuesday do a little jam session is such an organic and powerful scene. And by organic, I mean that it develops in a natural way as they write the song together. Carole starting off with the piano and humming the melody, Tuesday joining in slowly and slightly offbeat but only because she’s figuring out the chords. The next round Tuesday’s strum pattern changes and they begin to harmonize their singing, and then finally the lyrics. It seems like Carole and Tuesday each have two voice actors, their normal dialogue voice actor and then their singing voice actor. The lyrics look like they all will be in English, which is interesting. Also, I want to talk about the detail on the Gibson guitar, and the wonderful animation of Tuesday strumming. Lastly, I wanted to touch on the setting of Carole & Tuesday. Interestingly enough, they are currently living on Mars (which would explain the futuristic suitcase, skateboard, and architecture). It’ll be cool to see how life is envisioned on Mars! Carole & Tuesday doesn’t seem to be getting much attention and I think that it’ll be a dark horse this season getting up there with Kimetsu no Yaiba and One Punch Man. I’m looking forward to how Bones will develop this original story. And I’m anxiously waiting for the soundtrack to get released (which probably won’t be until a month or two after the final episode).